Seaplane flying is a specialty within aviation but it is one that has steady appeal and develops passionate aviators. I prefer to modify that "gear-up landing" line to… "There are pilots who love seaplane flying and there are those will love it." Be forewarned: Once you touch your seaplane* or floatplane* to the water, it may forever change you. If you think I'm being too dramatic, you probably haven't flown off the water. Great, so it's magical to see the countryside from a few hundred feet up. Even better, enjoy flying low across the clear, blue, warm waters of the Bahamas. Examine the shoreline of a big lake in a way you'd never do in a landplane. Compared to airports, seaplane pilots have many times more lakes or rivers able to handle a landing. All are fair game in an emergency and many U.S. waterways will permit normal water operations. Are you convinced yet? Water flying does require earning a Seaplane rating for Private or better pilots flying a certified floatplane or seaplane. However, for Sport Pilots or those using higher level certificates to exercise the privileges of Sport Pilot, only training plus a logbook endorsement is needed. Purchase cost of a seaplane can be, well… breathtaking. If you or someone you know has ever priced a general aviation aircraft on floats, you're aware they can be quite expensive. Flying from water demands a more robust airframe and amphibians add weight and complexity. Finding a qualified flight school and instructors with seaplane trainers and insurance for commercial training operations is another challenge although organizations like the dedicated Seaplane Pilots Association (SPA) can help overcome some of the preceding obstacles. All these facts conspire to make seaplane flying less common than it ought to be. Light-Sport Aircraft and Sport Pilot kits to the rescue. While still more costly than landline equivalents, LSA seaplanes carry price tags that are a fraction of certified aircraft on floats and they likely outperform their counterparts in general aviation. Even SPA — the water flying organization that has been more focused on certified floatplanes — is now flying a loaned Searey for a year or so to learn more about this segment of their community (photo). Here at Sun 'n Fun 2019, we saw two new entries in the LSA or Sport Pilot kit space. 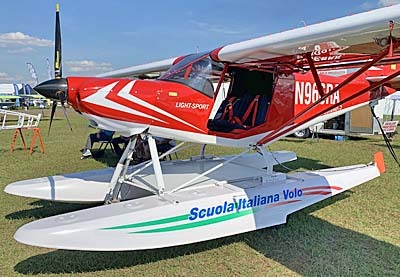 Italian manufacturer ICP representative (and airline pilot) Walter della Nebbia presented a bright red STOL Savannah on white composite amphibious floats. The floats were designed and built by an Italian organization (Scuola Italiano Volo) with many years of experience providing seaplane-only flight instruction. "He (the designer) is very knowledgeable," said Walter. "These are very good floats with lots of experience." Just Aircraft showed a Highlander on aluminum floats built by the owner from a Zenair float kit. Just has become known for their SuperSTOL model with the jaw-dropping performance. Highlander is the company's original LSA success story (#33 on our SLSA List) that, when significantly modified for special use, became SuperSTOL. 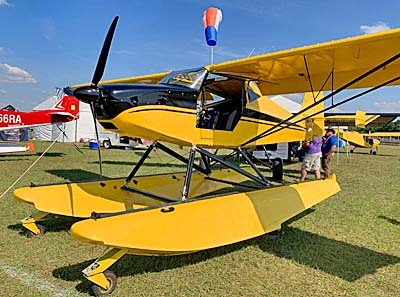 Besides these two entries the LSA industry offers several more choices of float-equipped land planes plus other boat-hulled seaplanes such as Progressive Aerodyne's Searey, Aero Adventure's Aventura, Seamax Aircraft's SeaMax, Vickers Aircraft's coming Wave, and others. 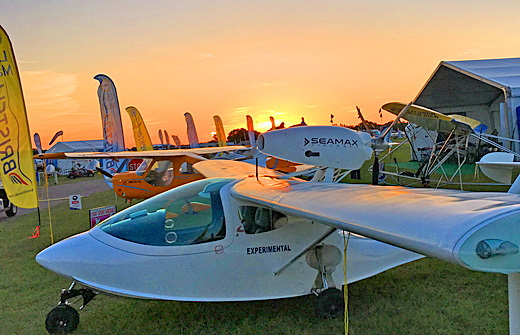 In the days ahead I'll also provide some coverage for a very affordable amphibious weight shift trike, Airtime Aircraft's Cygnet, built right here in Florida. While waterborne aircraft carry a higher price tags than land-only airplanes, seaplane flying has never been more affordable. Seaplane flying is a specialty within aviation but it is one that has steady appeal and develops passionate aviators. I prefer to modify that “gear-up landing” line to… “There are pilots who love seaplane flying and there are those will love it.” Be forewarned: Once you touch your seaplane* or floatplane* to the water, it may forever change you. If you think I’m being too dramatic, you probably haven’t flown off the water. Great, so it’s magical to see the countryside from a few hundred feet up. Even better, enjoy flying low across the clear, blue, warm waters of the Bahamas. Examine the shoreline of a big lake in a way you’d never do in a landplane. Compared to airports, seaplane pilots have many times more lakes or rivers able to handle a landing. All are fair game in an emergency and many U.S. waterways will permit normal water operations. Are you convinced yet? ICP gained brand name awareness primarily with their Savannah model, a short take off and landing airplane that sells for a modest price. We've seen it several times but always in tricycle gear. Now at Aero, everyone saw for the first time the new taildragger model from Italy's ICP. We spoke with company leader Loredana Arisio. We also take a look at their new light aircraft engine with questions answered by engine Andrea Caglio. ICP gained brand name awareness primarily with their Savannah model, a short take off and landing airplane that sells for a modest price. We’ve seen it several times but always in tricycle gear. Now at Aero, everyone saw for the first time the new taildragger model from Italy’s ICP. We spoke with company leader Loredana Arisio. We also take a look at their new light aircraft engine with questions answered by engine Andrea Caglio. The Italian design from ICP is the Savannah, one of the best performing STOL (Short Take Off and Landing) Light-Sport Aircraft. Skykits is a formerly Canadian company recently moved to Tennessee and they build major components from ICP into no less than four finished versions called the regular Savannah, VG, ADV, and Skykits special variation, the Rampage. Skykits' handsome facility at the Paris, Tennessee airport. With short take off aircraft and composite amphibious floats, Skykits is ready to capitalize on the popularity of float flying. Savannah is a off-airport vehicle. Fixed slats gave way to vortex generators. Skykits' newest Rampage is shown inside the company showroom. In the endless tree-covered rolling terrain of northwestern Tennessee resides a Canadian manufacturer of Italian aircraft. Welcome to Skykits, producer of two models of Savannah, a STOL (Short Take Off and Landing) design from ICP of Italy plus a newer variation of ICP's Vimana, which Skykits calls Rampage. *** Starting out in his native Canada, Eric Giles found a willing Tennessee community offering incentives if he set up shop at the local airport. Housed in a new facility (photos), Skykits ranks in the top 20 producers that generate about 90% of all SLSA registered to date. *** After ASTM-certifying four models Skykits offers three today: Savannah VG with vortex generators replacing earlier fixed leading edge slots; Savannah VGW, the VG's larger brother done in wide body form ("47 inches plus bubble doors"); and Rampage with electrically-deployable leading edge slats mated to Fowler flaps. The result of the latter effort, said Skykits, is "an airplane that will cruise at 115 mph yet land and takeoff in under 200 feet!" Indeed the company quotes takeoff over a 50 foot obstacle at just 319 feet. Go ahead and compare that to most LSA, though many can run significantly faster than the 100-knot cruise of Rampage. *** Skykits also sells the Savannah models in ELSA kit form and a carbon and Kevlar amphibious float system. *** An important distinction of Skykits airplanes are modest prices. In ready-to-fly form with 100-hp Rotax 912 engines, three-blade props, and basic panels, prices range from $74,000 to $85,000. No wonder the Paris company logged four sales at Sun 'n Fun 2010. [UPDATE 5/12/10] On a factory visit today, Eric Giles spoke about the excellent support he has received from the town of Paris, Tennessee including the mayor, airport manager, and other officials. His leased 21,000 square foot building is brand-new and a huge parking apron out front were provided as an incentive to encourage him to relocate from Canada. I'm always pleased to hear of such a warm welcome for a LSA company. In the endless tree-covered rolling terrain of northwestern Tennessee resides a Canadian manufacturer of Italian aircraft. Welcome to Skykits, producer of two models of Savannah, a STOL (Short Take Off and Landing) design from ICP of Italy plus a newer variation of ICP’s Vimana, which Skykits calls Rampage. *** Starting out in his native Canada, Eric Giles found a willing Tennessee community offering incentives if he set up shop at the local airport. Housed in a new facility (photos), Skykits ranks in the top 20 producers that generate about 90% of all SLSA registered to date. *** After ASTM-certifying four models Skykits offers three today: Savannah VG with vortex generators replacing earlier fixed leading edge slots; Savannah VGW, the VG’s larger brother done in wide body form (“47 inches plus bubble doors”); and Rampage with electrically-deployable leading edge slats mated to Fowler flaps. How Shall We Count New SLSA? Does it help to have your new SLSA blessed in the Hawaiian fashion? I don't know but that and a parachute might save you one day. This traditional ceremony welcomed the island's first SLSA, said Skykits. Barely over a month ago, I reported that Skykits Corp won their first approval for the Savannah. In that SPLOG posting I said that the plane would be produced with three wings mated to the same fuselage. Now, proving the point, Skykits president Eric Giles announced his second SLSA approval...for a Savannah ADV. 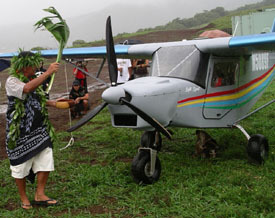 Eric also claimed the airplane delivered to Hawaii was the first SLSA to be registered in the state (photo). *** Savannah ADV has a tapered airfoil with full-span retractable leading edge slats and double-slotted flaps, both operated electrically with a mechanical backup. Skykits says, "The new wing increases cruise speed by 25 mph while maintaining the STOL capabilities. "As their company name implies, kits are also available. The questions arise, though: Is this a new model or a model variation? Do we count it as a new SLSA? We're bound to have more such questions as the LSA evolution continues. Barely over a month ago, I reported that Skykits Corp won their first approval for the Savannah. In that SPLOG posting I said that the plane would be produced with three wings mated to the same fuselage. Now, proving the point, Skykits president Eric Giles announced his second SLSA approval…for a Savannah ADV. Eric also claimed the airplane delivered to Hawaii was the first SLSA to be registered in the state (photo). *** Savannah ADV has a tapered airfoil with full-span retractable leading edge slats and double-slotted flaps, both operated electrically with a mechanical backup. Skykits says, “The new wing increases cruise speed by 25 mph while maintaining the STOL capabilities. “As their company name implies, kits are also available. The questions arise, though: Is this a new model or a model variation? Do we count it as a new SLSA? We’re bound to have more such questions as the LSA evolution continues.